The Red Roan Stallion is a book for junior youth. It is a fictional account of the story of the Persian Bahá’ís who were charged with finding the most outstanding horse for Bahá’u’lláh to ride out of Baghdad. A brother and sister and their uncle take a journey of danger, courage, and devotion to find the red roan stallion for their Lord. The book is also a tale of the suffering of refugees and religious persecution. I took a good look at the mare. Her beauty startled me. She looked pure Arabian with her small, shapely head, long elegant neck, and slim legs. Her silky tail arched out from her back making her appear larger than she really was and dropped gracefully down almost to her hoofs. She nickered, a low gently vibrating sound, offering a mixed greeting and warning before allowing strangers to come near her. Uncle moved slowly, but confidently, towards the mare, testing her nerves, as the stableman continued to hold her reins. Uncle brushed his fingers over her ears, then moved his hand down the saucer-like hollow in the middle of her forehead, down her delicate black muzzle, and finally stroked her throat. The mare stood motionless and looked as elegant as the queen she knew she was. Her coat was shiny cinnamon brown, with reddish undertones that picked up the sunlight. She was an unusual color for an Arabian. Uncle moved his hand down her arched neck and along her ribs checking to see the color of her skin underneath. I knew he was looking for the black skin that would show her pure Arabian heritage. “Bring the small saddle and prepare the mare,” he instructed his stableman. The stableman sized up Afshin and me, moving his eyes up and down from our feet to our head. He soon returned from the stable with a bridle, a saddle blanket, and a saddle that was small and shaped with a deeper curve than the usual flat desert saddle. The mare stood motionless as he saddled her and adjusted the girth. He looked down at my feet, measuring how high to adjust the stirrups. I ignored his helping hand and mounted on my own. I was aware of the men watching me. The stableman held her reins and led the mare around in a circle. “May I ride her by myself?” I made my voice sound shy like a little girl. The stableman looked to Mr. Fadhan, clearly reluctant to release the reins into my hands. Uncle saw his hesitancy and intervened. “I think she is safe to ride alone if she stays close to us.” His last words were for my benefit. “Let her go, but stay close.” Mr. Fadhan instructed the stableman. I felt both of us relax at the same time. I pressed my knees deeper, but still gently, into her ribs. Soon we were moving together like a breeze rippling over the open field. At the slightest touch of the reins she moved effortlessly. In her high-stepping prance she easily moved to the right and then quickly reversed direction to the left in a wide spiral. She poised in midair before her hoofs hit the ground. I left the men without realizing what I was doing or knowing where I was going. The mare and I became like one, dancing in the wind. Her long mane blew into my face. I felt free. I wanted to ride away and not come back. I barely heard Uncle call, “Zareen, enough! Come back!” Uncle’s harsh voice brought me to my senses. With only the slightest touch of the reins, the mare reversed her movement from a run, to a smooth canter, then to a walk. She moved so smoothly the ground beneath her hoofs was barely disturbed. A loud cracking sound came from above and to the right of us. I instantly reached down to press the side of the mare’s neck to comfort her and keep her from bolting, but it was unnecessary; she seemed unperturbed by the sudden sound of thunder. The wind lifted up a spray of sand. The first large drops of rain made dark shapes as they hit the dry ground. I had been riding for only a few minutes, but the expression on the men’s faces was as if I had been gone forever. I knew I would hear soon enough what Uncle thought of my behavior. The rain came as if up from the ground. Drops splattered around the hoofs of the mare. Intricate patterns formed within puddles upon the sandy soil. The heavy air was the color of sheep fleece. “Where is Afshin?” I called out as I rode back to Uncle Amin, Mr. Fadhan, and the stableman. The men spoke at once. Their tense voices cut through the sound of the rain. “He was just here!” Uncle exclaimed with disbelief. “He went to the stable, or he’s at my house with the children.” Mr. Fadhan turned one way, then another, looking in every direction. “He could not have gone far.” Uncle was also turning, looking in every direction. Mr. Fadhan shouted to his stableman, “Run! Check the stable. If he isn’t there, take the fastest horse.” He pointed at a distance in front of us, beyond the bulrushes. Uncle turned and ran to the house, looking in every direction as he went. I did the same from my higher position on the mare. Mr. Fadhan quickly returned, shaking his head, and waving his hands in a gesture that showed Afshin was not at his house. “Why am I standing here like a statue, doing nothing? I must look for my nephew before he reaches the wadi!” said Uncle. Uncle hesitated, but I did not. The mare seemed to read my thoughts. In one swift move, she turned in the direction of the wadi. I scanned the fields, from right to left, as she ran. I looked as far as I could see out to the horizon that seemed to grow darker by the second. In the wet soil behind the bulrushes there were fresh shoe prints, too large for Afshin’s feet and not shaped like the boots Afshin wore. A man in city shoes with pointed toes had just been in that spot. The prints disappeared where the ground dropped off to our right. The mare ran forward at a determined speed. I let her have her head and just held on. She threw back her ears and ran faster. I leaned into her mane to keep my balance. I felt a shudder ripple through her wet body. She swerved sharply. The ground was slippery from the pelting rain, but she kept her balance as she ran down an embankment. “What are you doing?” I shouted and jerked her reins back to stop her from running into the fast flowing water, but she was going her own way — right towards the danger, instead of away from it, like most horses would do. It seemed as if the water was pushing itself right up through the ground. I squeezed my knees into her ribs as she high-stepped through the rapidly rising water. Only later did I remember what happened next. Perhaps it was the sound — neither rain nor wind — that made me look up. An object flew right over my head. My eyes followed the object and found Afshin before the object did. He stood perfectly still, knee deep in the water that gushed up through the bedrock. “Afshin! Watch out!” I shouted. As if blown by the force of rain and the rushing river, a horse suddenly appeared. He reared up on his hind legs in front of Afshin. In that instant I thought Afshin would be killed either by the horse or by the object hurtling towards his head. I saw what it was: a long braided reed rope with one end wrapped around a stone as big as a man’s fists. The horse raised his forelegs, hooked the rope with one hoof, and brought it down. The stone on the end of the rope splashed into the water. The horse lifted his body high again, came down with the full force of his weight, and stomped the stone deep into the riverbed where it belonged. By that time the mare had run down into the wadi. During all the commotion Afshin stood motionless as the water rose up past his waist. Even from a distance, I saw that he was not afraid. The horse, a young red-colored Arabian stallion, swung his head around; his big body followed. In one leap he lifted his entire body over the rushing water. He landed smoothly with hardly a splash, turned his body, and knelt with his rump down in front of Afshin. He shook his head up and down beckoning Afshin onto his back. Afshin climbed on as if shinnying up a palm tree. He grabbed the mane and laid his wet body against the horse’s neck. The mare turned, high-stepped through the water, and climbed back up the slippery embankment we had just descended. I held onto her neck with all my strength to keep from sliding backwards. When we reached the open field, I righted myself and turned my head to look for Afshin. There, running beside us as fast and as effortlessly as the mare, was the red stallion, with Afshin lying face down in his mane. Artist Statement: Accounts of the horse which Bahá’u’lláh rode on the first stage of his journey to Constantinople served as the inspiration for The Red Roan Stallion, which was written during the height of the Arab Spring upheavals and during the on-going internecine wars in the Middle East. 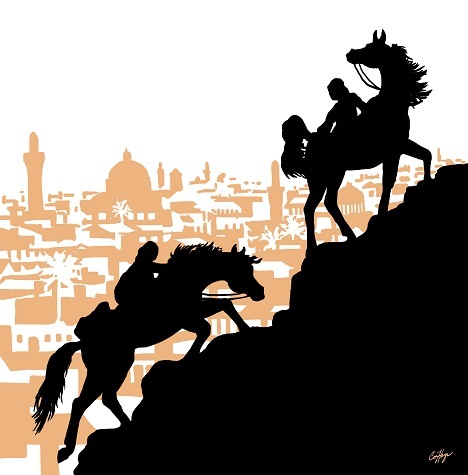 Gradually the story about two Persian children who found two magical horses in Baghdad evolved into a deeper story about a refugee family, religious bigotry, and exiled people of conscience. 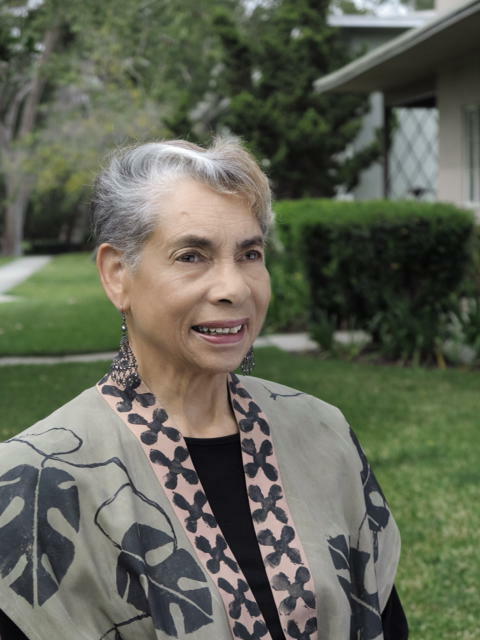 Bio: Beverlee Patton’s writing reflects a lifetime of interacting with people of diverse cultures. As an African American growing up and later working professionally in a mostly white world, she always felt bi-cultural. She has lived in Grenada, India, Nepal, and Namibia for more than twenty years during an academic career that combined performing arts, international socio-economic development, and intercultural communications. As an author and storyteller, she uses simple story lines to convey complex concepts. In her novel, The Red Roan Stallion, innocent children face devastating religious bigotry that unravels the life of their immigrant family.